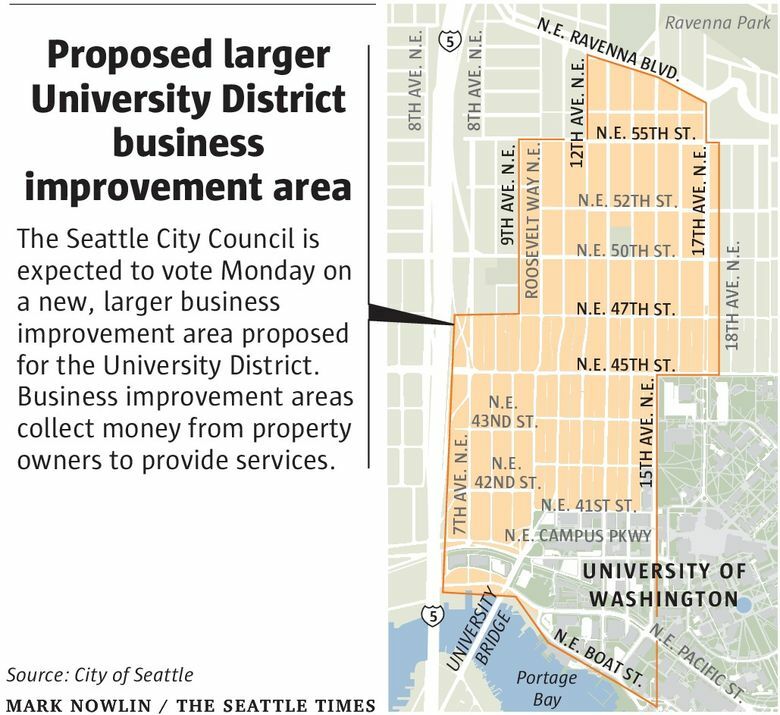 Proponents of a plan to create a larger business improvement area in Seattle’s University District say raising more money will help locals guide change. But opponents fear the move will speed up gentrification. A plan to collect money for street-cleaning and marketing from landholders across a larger swath of the University District has met with resistance from some condo and business owners who don’t want to pay and from people worried about gentrification. The Seattle City Council is expected to vote Monday on whether to create a new, larger business improvement area (BIA) in the U District, which would take special assessments from property owners, with the amounts based on property values. Proponents argue that the BIA would give existing landholders and business people more resources to help shape the future of the funky district in Northeast Seattle. But some opponents fear the bill is the first step in an attempt by the University of Washington to remake the U District exclusively for technology companies and affluent tech workers. They picture Seattle’s South Lake Union, which is thriving in many ways but has been criticized by some as a soulless glass-and-steel playground for the young and wealthy. Real-estate developers are stalking the U District because a light-rail station is scheduled to open on Brooklyn Avenue Northeast in 2021 and because city planners have been working on zoning changes that could allow more density with much taller buildings. Growing Seattle needs to add housing, and building it near light rail makes sense. But shiny new towers could replace cheaper old apartments. Andrew McMasters, director of Jet City Improv on University Way Northeast, known as The Ave, is a supporter of creating a larger U District BIA. “This district is going to change with or without us,” he said. The current BIA, launched in 1996, is relatively small, running up The Ave from Northeast Campus Parkway to Northeast 52nd Street, plus west to Brooklyn Avenue Northeast for a few blocks. The BIA proposed by McMasters and others would stretch from the Montlake Cut to Ravenna Boulevard and from 15th Avenue Northeast to Interstate 5. There are now nine BIAs in Seattle, and a tenth may form in Ballard. John Fox, a longtime activist with the Seattle Displacement Coalition, also is afraid of the U District becoming like South Lake Union. But unlike McMasters, Fox contends that pumping up the BIA would hasten that process. “This is all being driven by the UW wanting to turn this place into a high-density hub for tech startups affiliated with the school, and to heck with the U District’s existing character, its diversity and its low-density, low-income housing,” he said. Though Fox, in organizing resistance to the proposal, has warned about a larger BIA using its money to lobby city officials for a broad upzone, the ordinance under consideration by the council now includes language prohibiting BIA funds from being spent on political advocacy related to land-use and zoning changes. That clause, however, was added after opponents complained, and the ordinance wouldn’t bar a more muscular BIA from marketing the U District to startups and hosting conferences with an eye toward transforming the district, Fox notes. The existing BIA spends its funds mostly on street-cleaning and a street fair. Its current assessment total is $138,263. The new BIA would take about $750,000 a year. Proponents have said more resources would help them tamp down persistent street crime and work against public abuse of drugs and alcohol. Shirley Nixon says she and other people — mostly older folks — who own homes in the University Plaza condominium tower shouldn’t be included in the new BIA because they live far away from The Ave, which has always been the heart of the U District. They also shouldn’t be included because state law states that business improvement areas can’t collect assessments from residential properties with fewer than four units, she says. Though University Plaza has 125 units, each condo should be considered equivalent to a single-family home, under the intent of the law, Nixon argues. Some opposition to the BIA proposal and the UW’s involvement is process-related. To secure city sanction, organizers of a BIA must obtain petitions showing support from property owners representing 60 percent of the total amount of money to be assessed. The organizers of a new U District BIA met that standard for their proposal, snaring 67 percent. But the UW, on its own, accounts for nearly 50 percent of the support. Opponents have pointed out that the school normally wouldn’t be counted because it’s a tax-exempt nonprofit. But the UW plans to give the BIA about $350,000 annually and city lawyers have signed off on that arrangement, according to council staff. Hardwick, whose father and grandfather ran the store before him, objects to the property being included in the larger BIA. He doesn’t want to pay an assessment and is worried about changes in the district causing an increase in property taxes. Another source of anxiety for Hardwick is the possibility that small-time property owners won’t have much sway over the BIA relative to major players like the UW. Hardwick should rest easy, according to Theresa Doherty, a UW official who’s been working on the proposal. The ordinance would set up a ratepayers board to oversee the BIA and would require that the board be no more than 35 percent from the UW. Fox acknowledges that the ordinance would prohibit the UW from controlling the ratepayers board outright. But the day-to-day operations of the BIA wouldn’t be carried out by the board, he noted. Those would be contracted out to a program manager, and the city initially intends that to be U District Partnership. The U District Partnership is a year-and-a-half-old organization created by the now-defunct University District Chamber of Commerce and the UW. It manages funds collected by the existing BIA, and many of its members also were involved in something with a similar name, the University District Livability Partnership, a recently concluded initiative to give city planners local input on zoning and design. The U District Partnership hired a president last August and has coordinated the push for the larger BIA. The impression Nixon has is that city officials are allowing the U District Partnership to control the BIA rather than the other way around, she says. On April 3, the City Council’s finance committee recommended approval of the new BIA, with some changes. The committee added the University Park neighborhood to the map and subtracted part of the Roosevelt neighborhood. McMasters says people working against the new BIA have engaged in “fear-mongering” because they oppose change and don’t want to pay for progress. The larger BIA’s proponents are a mixed group with varied views on zoning, he insists. But Hardwick says his own fear is real. In his mind, the BIA and the potential upzone are linked and mean that 340-foot-tall buildings will sprout, causing property taxes to soar. “I have a lot of customers, people in the trades, boat builders and cabinet makers, the people who fix your roof, and they don’t like what’s going on,” he said. Information in this article, originally published April 26, 2015, was corrected April 27, 2015. A previous version of this story gave an incorrect northern boundary for the proposed larger business improvement area.